During our Christmas in July Sale you can save up to 50% off holiday decor! Stock up on your favorite Annalee dolls and ornaments. We know you love planning ahead for the holidays. Why not take advantage of our largest discounts of the year? SAVE BIG and start thinking ahead to festive decorating, gift giving and celebrating the magic of the season! SAVE BIG – up to 50% off. SAVE BIG on ornaments and holiday decor when you plan ahead for this upcoming holiday season. Right now, many of our collectors are enthusiastically working on ideas to decorate their halls, doors, tables and trees with an abundance of spirit and holiday cheer. Take a look at some of the most popular ways to display Annalee dolls! Why not get inspired, plan ahead and share your ideas with our other fans. The deals during our limited sales event are first come, first serve. Shop today as the supplies and prices won’t last. Decorating your home’s entryway is a great way to show your holiday spirit. Annalee dolls make fun accents to holiday wreaths! 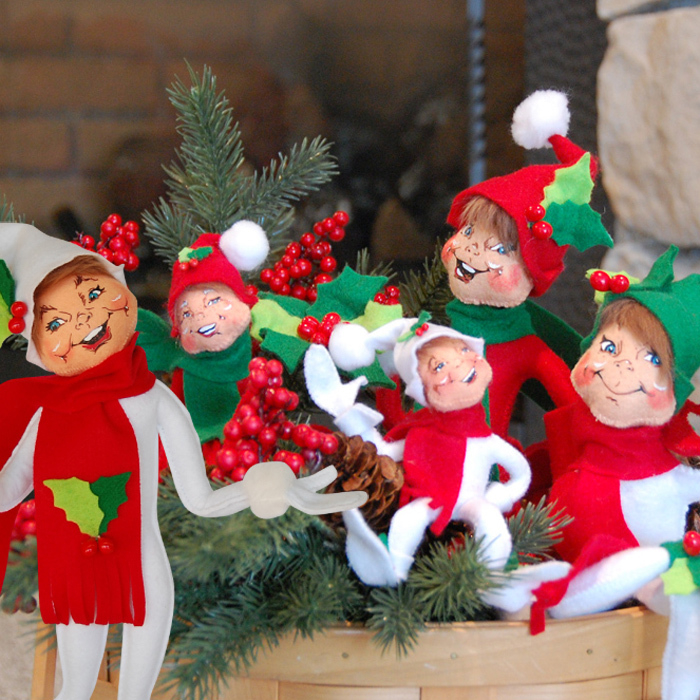 Greet your guests with a smile and spread cheer this holiday by adding an Annalee Santa or some mischievous elves into your holiday door displays. Love entertaining during the holidays? The dining room or kitchen table is prime real estate for a festive centerpiece display. Get creative and consider adding a jolly elf to your festive pine and berry decorations for a bit of extra merriment! Don’t forget: Centerpieces aren’t limited to Christmas. We have great dolls for every major holiday and season. Rethink the standard garland and classic candlesticks on your fireplace this year! Annalee dolls, with their cheery smiles, have long been overlooking family gatherings and setting the scene of magical holiday. With bright and cheerful faces and fun-spirited designs, Annalee’s holiday ornaments and tree toppers make great heirloom gifts! Deck out your Christmas tree with Annalee’s classic designs and spread some joy this season. Each ornament comes carefully packaged in a box, perfect for safe storing or gift giving! Many of our collectors love to add a new ornament to their collection every year. Annalee angels make sweet Christmas tree toppers are on sale now! SAVE UP TO 50%! For more decorating ideas visit Annalee on Pinterest. Get Started with Popular Product Bundles On Sale Now!